Setting new standards in large size electrics, the Swift will outperform the competition with lightning speed. 3 times bigger than 450 size. Setting new standards in large electrics, the Swift will outperform the competition with lightning speed. The main shaft is 10mm and hollow making it ultra light. The control system is none other than the very precise 120 degree eCCPM found in the Predator & Raven with a rear mounted rudder servo. The Swift will also feature a belt drive and built-in autorotation system. The horizontal fins and vertical fins are made slim and exotic resulting in additional weight savings. The main frames were built with weight reduction and structural rigidity in mind. The helicopter with motor and servos as configured weighs in at a mere 3.4lbs. With it's lightweight components and instantaneous electric power, the Swift has earned it's named which was derived from the world's fastest species of birds. Swift 16 comes in two version, Kit and ARF (Almost Ready to Fly). 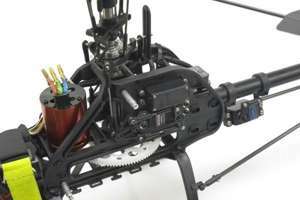 The parts of the R/C Helicopter on the Kit version require assembly while most of the parts for the ARF version come preassembled for your convenience. Just Provide (Items required to flybut not included): 1x 6-Channel or better Radio Transmitter capable of 120 degree eCCPM mixing with Transmitter Battery, and Transmitter Battery Charger 1x 6-Channel or better Receiver 1x Brushless Electric Motor 1x 50 Amp or better Brushless ESC 1x Pinion / Motor Gear 4x Standard or better Servos 1x Gyro (Heading Hold/Lock recommended) 1x 4S-6S Li-Po or 12 Cell NiMH Battery 1x Battery Charger 1x Transmiter Crystal 1x matching Receiver Crystal 1x Velcro Set (to hold battery) 1x RC Helicopter Tools Swift 16 Featured: * Fall Fest 2006 Fun Fly (12/12/06): Adam Turner showed the versatility of a stock Swift 16 at Fall Fest 2006. Adam Turner was the pilot of the 1st ever electric helicopter, the Swift 16, that won a competition. Video of his spectacular demonstration of a stock Swift. His setup for this demo: * Stock Swift 16 Helicopter * Century Outrunner 600 Plus brushless motor * RotorTech� 560mm Carbon Fiber Main Blades * ELECTRON 80/100 BRUSHLESS ESC * MOTOR GEAR - 13T, 5mm, 1.0 MODULE * Futaba S3151 Digital Servo Sport BB * Futaba GY401 Gyro with 9254 Servo * Flightpower EVO20 Li-Po 4S1P 3700mAh 14.8V Battery. * 2006 Clubman 3D, UK (05/15/06): The 2006 Clubman 3D competition in the United Kingdom was the site of the very 1st electric helicopter that ever won a competition. The helicopter that won: Swift 16. It was piloted by Adam Turner. Video of his winning routine. * RcUniverse.com Review (04/21/06): "The Swift is a bargain electric in this size, and its fantastic performance won't disappoint!" RcUniverse.com Full Review * Alan Szabo Jr. flies Swift 16 (12/19/05): The Swift flown by Alan Szabo Jr. His setup: Kontronik Tango 45-10, 11T pinion gear, 6S2P Li-Po battery.